Attacks on Christians who believe in Creation are usually mealy-mouthed diatribes based on lack of knowledge, and a rejection of a real scientific process. These attackers, with supercilious smirks on their faces, pretending to be reasonable, have no idea that evolution depends on their obedience to ignorance and complete lack of proof. (That goes for Christian ‘theistic evolutionists’, too). I have even seen the same ignorance in scientists who can’t tell the difference between ‘evidence’ and ‘proof’, and who ignore proper scientific methods. There are, then, ‘evolutionists’ who are trained scientists, but whose minds are captivated by unessential evolution hypotheses, pretending that evolution can ‘help’ them come to rational conclusions; and there are ‘laymen’ who are just PC, obeying evolution ideas as if they were real, yet having no idea what the scientific process is. These people have no idea that MANY thousands of scientists, including world leaders in their fields, are Christians! Most of them are Creationists. And even many non-Christian scientists have honestly come to the conclusion that ‘Intelligent Design’ (ID) is found throughout the scientific world. (ID is not the same as Creationism but is very similar, because it says there is evidence of design, requiring a designer. However most ID supporters are NOT Christians, but just honest scientists who allow the evidence to lead to its own conclusions – proof). Let me introduce you to just one Christian scientist who believes in Creation. He came to his conclusion after starting out as an atheist, and coming across firm and undeniable evidences for Creation as a cause of what we see around us. He is geneticist Dr Jeffrey Tomkins. The content is abstracted from an interview he had with another scientist (creation.com), and his words are typical of thousands of scientists throughout the world, whether supporters of ID or Creationism itself. Therefore, to denigrate his ideas is to be extremely abusive and offensive. Dr Tomkins was secular until, in college, he had a Christian roommate who passed on biblical truth to him. The evidences were so compelling that he became a Christian himself. Not by brainwashing, because his mind was already attuned to secularism, ‘no God’, and a strictly evolutionary scientific mind. This symbiotic relationship (unbelief and Christian witness) is necessary, because it is needed to get rid of the deliberate brainwashing by evolutionists, who want to hide everything Christian and references to scripture. They fear the biblical implications and so hate the Bible and Christians. Their refusal to let their unverifiable ideas take a stage in the marketplace of ideas tells us they are afraid of the challenge and KNOW they are wrong. This silencing is rampant in all spheres of endeavour, because unbelief is a strong deceiver. These folks KNOW they are wrong and that is why they shout so much against Christian beliefs; it has nothing to do with the strength of evolution (because there is absolutely NO proof whatever for its existence. Rather, weak evidences are used as a bluff, a replacement for actual proofs). Psychological hint – Next time you hear or see an evolutionist shouting the odds, remember that the louder they shout the more it indicates their fear of truth, and know they are wrong. After he was saved (became a Christian) Dr Tomkins first read a popular book by a Christian theistic evolutionist, who tried to incorporate the long ages of evolution with the Genesis account. However, as he says, “both the science and the theology didn’t make much sense using this twisted approach”. It was not until he came across books by the science-pioneers of creationist science, Dr’s Henry Morris and Duane Gish, that he could see a true and acceptable mesh between science and biblical theology. Dr Tomkins said what he read “was supported by hard scientific data” and “I quickly realised that evolutionary ideas (including eons of deep time) are part of a failed paradigm that exists only in the minds of deceived men, not scientific reality”. He took classes in plants, farm animals, microbiology and entomology, and plainly saw “examples of intelligent design by the Creator”. Later, as a graduate, he focused on physiology and then genetics. In these studies he saw “overwhelming” organismal complexity, which increasingly made evolution claims look ridiculous, and “every new discovery… in the genome only bolsters my faith even more.” This is fact: Darwin worked with primitive science. The more detail we learn in the sciences, the deeper we go, showing the immense complexity of life, the greater are pointers towards a Creator. His growing faith also increased his love of learning, real learning, and enhanced his studies in post-graduate work in genomics and genetics. As he says, his creationist approach helped him to “sail through” his PhD work, giving him “straight ‘A’s” and great success “in the area of quantitative genetics”. By contrast, evolution hampers real studentship, like steps put in your way in the dark, causing people to stumble. This is because evolution misleads thinking, whereas belief in Creation assists the ability to come to reasonable and accurate conclusions. (In my Master’s degree work I concluded that it is not the observation of data that leads to wrong conclusions, but the later interpretation of that data, arising from a false presupposition, e.g. the brainwashing of evolution, which starts in schools and continues into university courses. 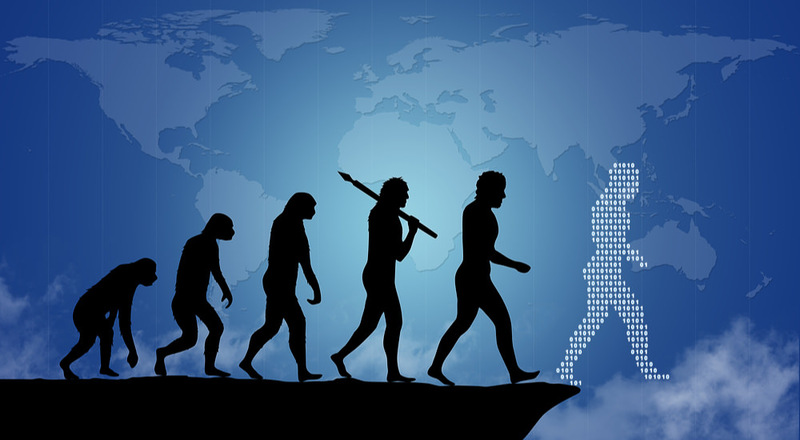 Evolution is ideal for non-thinkers, PC lovers, and God-haters! But, its results are impossible and unworkable). Though his work was enhanced by a belief in Creation, he admits that evolution still rules academia. “Unfortunately, the religion of evolution dominates our secular universities. You can be a Christian and a creationist, but you had better keep your mouth shut about it if you want a job.” (Which is why he left his university post). This is an universal fact and it is appalling. It is academic thuggery, a form of fascism. Even so, it shows that a Christian scientist can do his work without any link whatever to evolution. Dr Tomkins’ later work, which is still current, proves beyond doubt that the evolutionist’ claim that humans are close to chimpanzees, is false. By using his knowledge of genuine genetics, he shows the similarities are far fewer than is claimed (we are NOT ‘animals’). We should note, too, that God created all things, and many organisms share many similar characteristics – but ‘similar’ does not mean ‘the same’. Space does not permit a longer article, but it is suffice to say that Dr Tomkins’ statements can be multiplied many thousands of times in the field of physical sciences. But, evolutionists silence their work and, often, great scientific benefits are minimized or lost because of their meddling. Creationists, then, try not to rock the evolution boat, a boat made heavy with incredulously numerous barnacles and holes, which, in intellectual terms, should have sunk long ago! Christians should not be afraid to denounce evolution, even if they are afraid to stand up for Creation. They can do it because there is no science behind evolution. Every denunciation causes fear in the hearts of evolutionists, who cover their confusion with pompous pseudo-arguments, that ‘science proves evolution’ No, it does not, and that is the point! People like Dawkins are spouters-of-deception, not truth. I have argued against professors of various scientific fields. My ministry colleague, Dr Waddell, once argued against the claims of his own university geology professor, with amazing results. The professor was unable to provide real scientific evidence for long periods of time in the rocks, when pressed by genuine science. It caused a big stir, and Dr Waddell did not suffer ‘consequences’. Though it is sound advice to not shout out about Creationism if you want to keep your job, it is not a good reason to stay quiet per se. By staying quiet, not only does it bow to scientific error, but it slows down true research. But, as one who has fought these wars, I couldn’t care less about consequences. What should matter to every Christian is – truth. This extends outwards from faith to any sphere of activity in the world. More importantly, evolution trashes the Gospel. And that is why the subject is so important. Think about it.